Golden Green Foliage Ferns Abstract Summer Mandala is a design of glorious vibrant shades of green and gold pierced by brilliance. Deep rich beautiful shades of lime green, yellow-green and fern green dance in a mandala. Golden Green Foliage Ferns Abstract Summer Days Mandala Foldable Umbrella makes rainy days more fun. In fact you may start to wish for rain! Golden Green Foliage Ferns Abstract Summer Days Mandala is a design of glorious vibrant shades of green and gold pierced by brilliance. Deep rich beautiful shades of lime green, yellow-green and fern green dance in a mandala. You can see the lines of a hand drawn Zendoodle through this elegant translucent pattern. You can see the black lines peeking through. There are many complex layers of lines and design weaving in and out of its borders. You will want to bring Golden Green Foliage Ferns Abstract Summer Days Mandala along even on sunny days, being ready for rain! This shamrock green circle design has many shimmering patterns within this Irish design. St Patrick’s Day and Ireland come to mind. Piercing bright green, moss green and golden colors pulsate throughout this magnificent pattern with hints of lawn green and spring bud. Summer, foliage, ferns, woods and greenery come to mind. Orange, gold, red, amber, salmon and apricot give life and movement to this mandala. Lines of gold light pierce this mandala as they dance through this intricate design. Vibrant colors and design contain an explosion of different shades of apple green, spring green, flame and tangerine, plus elements of design that will delight your senses. It is very unique and unusual to have a mandala combined with a Zendoodle – very chic! 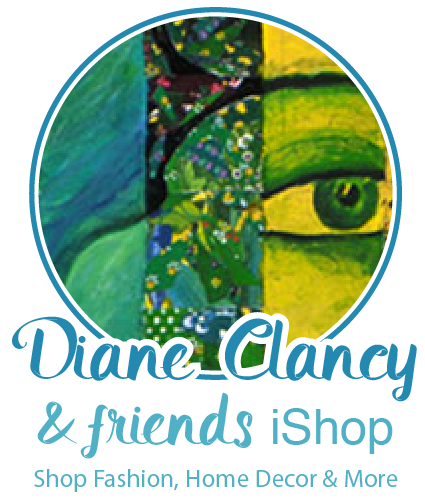 To see all products from Diane’s ArtsAdd shop CLICK HERE.